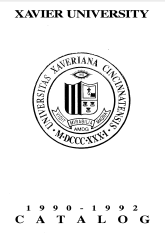 Catalogue of St. Xavier College, Cincinnati, Ohio, 1907-08. Cincinnati: The Mountel Press, Power Building. 1908.